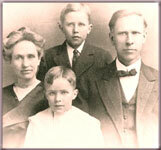 Lawrence (top center) with his parents and brother. 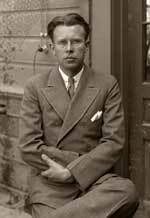 Ernest Lawrence was born on August 8, 1901 in Canton, a small town on the South Dakota prairie. His parents were of Norwegian ancestry and taught in the local Lutheran academy. They instilled in Ernest and his younger brother John middle-class values, a sense of responsibility and devotion to hard work and scholarship. Like many of their generation, Ernest and his boyhood friend Merle Tuve tinkered as teenagers with radios. Lawrence shared with Tuve and some other future physicists a resemblance to Martin Arrowsmith, the hero of a novel of 1925 by Sinclair Lewis. These attributes included energy and enthusiasm, Midwestern unsophistication, and dedication to science. "Mrs. Arrowsmith, this lad Martin is a passionate fellow, not a drudge. He must be passionate on behalf of mankind. He's chosen the highest calling in the world, but he's a feckless, experimental devil." Stanley Tobiason, Ernest, and John Lawrence on the South Dakota prairie en route to the Black Hills. At the age of sixteen Lawrence entered St. Olaf College, a small Lutheran school in Minnesota. He intended to study medicine. After a year he transferred to the University of South Dakota, where he shunned fraternities for his studies. A professor of electrical engineering convinced Lawrence that his interest in radio pointed toward physics instead of medicine. In 1922 after graduating with high honors, Lawrence joined Tuve for advanced study in physics at the University of Minnesota under professor W.F.G. Swann. Lawrence followed Swann to the University of Chicago and then to Yale, where he completed his Ph.D. in 1924. Lawrence's dissertation on the photoelectric effectthe emission of electrons from a body struck by lightwas relevant to the new quantum physics. Ernest as the young student and summertime salesman. In college Lawrence bought a surplus Navy radio set from World War I. Striking a bargain on castoff military radio equipment would become a habit. "Cut-and-try sometimes is more important than too prolonged theorizing." Many American scientists of Lawrence's generation matured with the help of a new system of postdoctoral fellowships, which encouraged research rather than teaching. 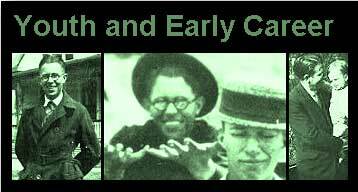 The National Research Council, established during World War I by the National Academy of Sciences, started granting such fellowships in 1919 with funds from the Rockefeller Foundation. American physicists, especially theorists, often used the postdoctoral fellowships to study in Europe. They brought home from Göttingen, Copenhagen, and Munich the new theory of quantum mechanics and began to teach it to their own students. Others, especially experimentalists, did postdoctoral research without going abroad. Lawrence, taking advantage of the first-rate physicists and well-equipped facilities at Yale, used his fellowship to continue research on photoelectricity and to start work on how atoms of a gas struck by electrons are ionized (an ion is an atom that has more or less than its normal number of electrons). With fellow Midwesterner Jesse Beams, Lawrence at Yale studied short bursts of light and the length of light quanta. Ernest and Molly Lawrence with their first child, Eric, in Berkeley in 1935. Despite a seemingly boundless capacity for work, Lawrence found some time for a social life. He met and courted Mary Blumer, the eldest daughter of a Yale professor of medicine. Molly, as she was known, at first spurned his advances, but Lawrence was nothing if not persistent. He finally won her over and they married in May 1932. They would have two sons and four daughters. Ernest Lawrence about the time he came to the University of California at Berkeley, August 1931. Lawrence approached physics with a practical, experimental bent that followed the advice of Swann, his graduate advisor: "Cut-and-try sometimes is more important than too prolonged theorizing." The American tradition of pragmatism, prominent in the writings of William James and John Dewey, saw the value of knowledge in action, not contemplation. Lawrence would also exhibit another American predilectionfascination with big machines. Visiting European scientists of the time noted "the technological extravaganzas that Americans like so much." "Americans seem to work very well, only they obviously insist on making everything as big as possible." German physicist Franz Simon's impression upon a visit to the US in 1932.